Monit is a free open source utility for managing and monitoring, processes, programs, files, directories and filesystems on a UNIX system. Monit conducts automatic maintenance and repair and can execute meaningful causal actions in error situations. 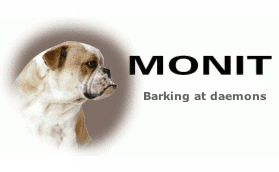 You can use Monit to monitor daemon processes or similar programs running on localhost. Monit is particular useful for monitoring daemon processes, such as those started at system boot time from /etc/init.d/. a) Monit can start a process if it does not run. b) Restart a process if it does not respond. c) Stop a process if it uses to much resources etc. start program = "/scripts/restartsrv httpd"
stop program = "/scripts/restartsrv httpd"
I believe, it is better if you use “/scripts/restartsrv httpd” instead of “/etc/init.d/httpd start” if you are on cPanel/WHM server. Add monit to rc.local so that it starts automatically when your server starts. You will see a message “Starting monit daemon” at the end if everything goes perfect. That should start monit as deamon and check the ports on every 60 seconds. You can monitor other services using monit such as mysql, exim etc. To do so, create a new file at /etc/monit.d/ and save it with the appropriate commands to check and restart code. Be sure to re-execute monit after adding this. let me thank you for this great post, I have installed monit using your instructions and can browse it now, but only apache status is showing there, although I have added mysql monitoring as you written but still its only showing httpd in process area. BTW, server is cPanel/WHM.